The 74-year-old was set to take the stage at New York's Radio City Music Hall on 15 September (16), alongside the likes of Elton John, Billy Joel, Lady Gaga, and Stevie Wonder, for the taping of the TV special, titled Tony Bennett Celebrates 90: The Best Is Yet to Come, but she has been forced to sit out the big party. 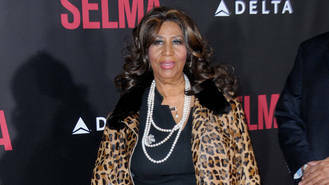 Aretha broke the news to fans on Monday (22Aug16), revealing she is also scrapping a handful of other live gigs. "Due to doctors' orders, I will have to cancel a few concerts for the next month or so," she announced in a statement obtained by The Associated Press. She did not elaborate on why she's feeling ill, but she is expected to return to the road in November (16). Aretha's affected shows include a Virginia concert at the Wolf Trap National Park for the Performing Arts on 26 August (16), and a solo date in the Big Apple on 23 September (16). Franklin also pulled the plug on a pair of shows in Florida in March (16) due to a "lack of band personnel", while last summer (Aug15), she postponed a planned appearance at The Colosseum at Caesars Palace in Las Vegas due to exhaustion, and in October (15), she axed two gigs in Oklahoma, amid fears she would not be able to cope with the gruelling travel schedule. At the time, she said, "After such a long, 4,200 mile drive to the West Coast in July, I'm not prepared to drive as far west so soon again. I am so sorry to have to disappoint my fans there, but I will reschedule."